AGO Creative Minds returns to Massey Hall this spring to discuss Art and Truth. Moderated by CBC’s Anna Maria Tremonti, internationally celebrated writer Salman Rushdie, provocative performance artist Andrea Fraser, award winning filmmaker Charles Officer and JUNO nominated musician Iskwé take to the stage to debate the role of art in distinguishing right from wrong, and to consider how notions of truth are related to broader social, economic, political and intellectual forces. 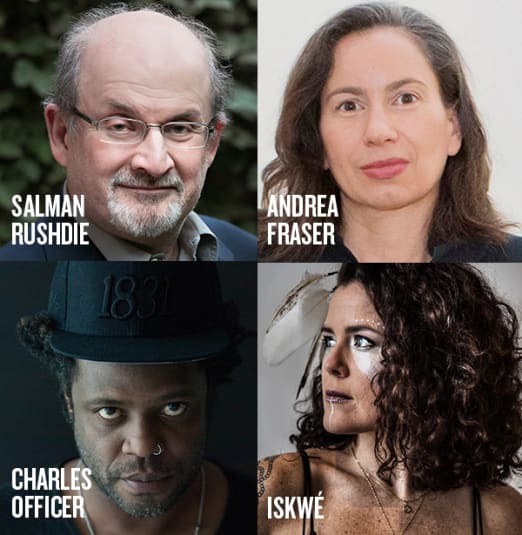 IMAGE CREDITS: Salman Rushdie photo by Beowulf Sheehan, Andrea Fraser photo by Jürgen Schulzki, Charles Officer photo by Justin Morris. CREATIVE MINDS is a landmark series of discussions that brings together visionary artists to discuss their work and the urgent social, political and cultural issues of our time. Four leading Canadian cultural institutions—the Art Gallery of Ontario, Massey Hall, the Canadian Broadcasting Corporation and Banff Centre for Arts + Creativity—have come together to create this initiative with the support of Series Presenters Jonas & Lynda Prince, whose leadership inspired the development of the project. The conversations are moderated by a leading journalist and each event opens with a musical performance, a nod to the legacy of Massey Hall. The events are streamed online and broadcast on radio by CBC, giving audiences across Canada an opportunity to hear what the artists have to say. Creative Minds aims to examine the present and imagine our futures through the eyes of artists, celebrating the vitally important role they play in shaping our lives, our ideas and our world.